3 5/8 by 4 5/8 in. 9.2 by 11.7 cm. 9 1/4 by 13 1/8 in. 23.5 by 33.3 cm. 10 1/2 by 8 3/4 in. 26.7 by 22.2 cm. 3 1/8 in by 4 9/16 in. 7.9 by 11.6 cm. 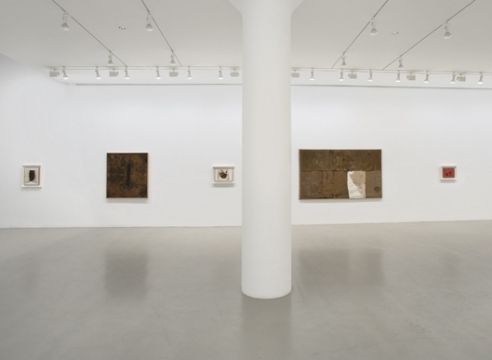 Italian artist Alberto Burri is known for his reliefs that successfully blur the line between painting and sculpture. As a result of his interest in materiality, the artist’s figurative work often investigates the use of non-traditional materials such as burlap, wood, tar, plastic, and zinc oxide. Burri’s unorthodox technique placed the artist at the forefront of an international wave of younger artists who also pushed at and beyond the perimeters of painting by introducing unconventional materials and techniques, a group that included Robert Rauschenberg, Yves Klein, Donald Judd, Günther Uecker and Burri’s friend Lucio Fontana. Alberto Burri was born March 12, 1915 in Città di Castello in the Umbria region of Italy. In 1940 he received a degree in medicine from the Università degli Studi di Perugia. 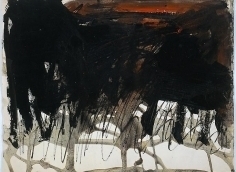 Burri later served as a frontline soldier and physician in the Ethiopian campaign and in World War II, which ultimately influenced his signature style of painting. He died in 1995 in Nice, France. His first solo exhibitions in the United States took place in 1953 at the Allan Frumkin Gallery, Chicago, and the Stable Gallery, New York; that same year his work appeared in Younger European Painters: A Selection (1953–54) at the Solomon R. Guggenheim Museum. The Carnegie Museum of Art in Pittsburgh organized his midcareer retrospective in 1957. Burri’s work has since been exhibited in museums and galleries across the globe. Most recently in 2015-16, the Guggenheim Museum in New York showed a major retrospective of his work entitled The Trauma of Painting.